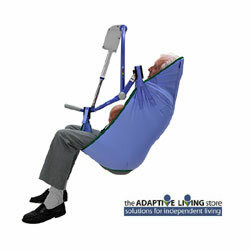 General purpose clip sling for everyday bed and chair transfers. ArjoHuntleigh General Purpose Clip Slings provide good comfort and support for a range of everyday patient handling routines such as bed and chair-related transfers. An unpadded solution is often suitable for normal usage. With no padding in the leg area, an unpadded sling is also easier to apply to residents/patients with skeletal or spinal conditions. The extended leg version is suitable when a larger circumference is needed for the leg pieces.